Fiber optic network design refers to the specialized processes leading to a successful installation and operation of a fiber optic network. It includes first determining the type of communication system(s) which will be carried over the network, the geographic layout (premises, campus, outside plant (OSP, etc. ), the transmission equipment required and the fiber network over which it will operate. Designing a fiber optic network usually also requires interfacing to other networks which may be connected over copper cabling and wireless. Next to consider are requirements for permits, easements, permissions and inspections. Once we get to that stage, we can consider actual component selection, placement, installation practices, testing, troubleshooting and network equipment installation and startup. Finally, we have to consider documentation, maintenance and planning for restoration in event of a future outage. The design of the network must precede not only the installation itself, but it must be completed to estimate the cost of the project and, for the contractor, bid on the job. Design not only affects the technical aspects of the installation, but the business aspects also. Finally, a fiber optic network designer needs to understand the processes of installation. We recommend you review the FOA Guide sections on fiber optic installation covering basic fiber installation and OSP fiber installation. Designers should have an in-depth knowledge of fiber optic components and systems and installation processes as well as all applicable standards, codes and any other local regulations. They must also be familiar with most telecom technology (cabled or wireless), site surveys, local politics, codes and standards, and where to find experts in those fields when help is needed. Obviously, the fiber optic network designer must be familiar with electrical power systems, since the electronic hardware must be provided with high quality uninterruptible power at every location. And if they work for a contractor, estimating will be a very important issue, as that is where a profit or loss can be determined! Those involved in fiber optic project design should already have a background in fiber optics, such as having completed a FOA CFOT certification course, and may have other training in the specialties of cable plant design and/or electrical contracting. It’s also very important to know how to find in-depth information, mostly on the web, about products, standards, codes and, for the OSP networks, how to use online mapping services like Google Maps. Experience with CAD systems is a definite plus. But while the contractor generally considers the cabling requirements first, the real design starts with the communications system requirements established by the end user. One must first look at the types of equipment required for the communications systems, the speed of the network and the distances to be covered before considering anything related to the cable plant. The communications equipment will determine if fiber is necessary or preferable and what type of fiber is required. Premises cable systems are designed to carry computer networks (LANs, local area networks) based on Ethernet which currently may operate at speeds from 10 megabits per second to 10 gigabits per second. The typical LAN has copper and fiber sections and links to connect to wireless access points for universal WiFi connectivity. Data centers are unique applications that house multiple Internet servers and storage networks operating at very high speeds using combinations of short copper and fiber links. Other systems may carry security systems with digital or analog video, perimeter alarms or entry systems, which are usually low speeds, at least as far as fiber is concerned. Premises telephone systems can be carried on traditional twisted pair cables or, as is becoming more common, utilize LAN cabling with voice over IP (VoIP) technology. Premises networks are usually short, often less than the 100 meters (about 330 feet) used as the limit for standardized structured cabling systems that allow twisted pair copper or fiber optic cabling, with backbones on campus networks used in industrial complexes or institutions as long as 500 m or more, requiring optical fiber. Premises networks generally operate over multimode fiber. Multimode systems are less expensive than singlemode systems, not because the fiber is cheaper (it isn’t) nor because cable is cheaper (the same), but because the large core of multimode fiber allows the use of cheaper LED or VCSEL sources in transmitters, making the electronics much cheaper. Astute designers and end users often include both multimode and singlemode fibers in their backbone cables (called hybrid cables) since singlemode fibers are very inexpensive and it provides a virtually unlimited ability to expand the systems. LANs and data centers operating at speeds over 10Gb/s are migrating to singlemode fiber so more premises cabling systems include singlemode. Premises networks will include a entrance facility where outside plant and premises communications systems meet. This facility must include not only cabling connections but compatible communications equipment. Since it is indoors, it must consider issues for building and electrical codes, such as the common requirement that bare OSP cables can only come 50 feet (about 15 meters) before being terminated in fire-rated cables unless it is in conduit. Outside plant networks refers to all systems that are outdoors, not inside buildings or campuses. They are typically longer networks uses for telecom, CATV, utilities, security, metropolitan networks, etc. Besides telecom and CATV, there are many other OSP applications of fiber. Intelligent highways are dotted with security cameras and signs and/or signals connected on fiber. Security monitoring systems in large buildings like airports, government and commercial buildings, casinos, etc. are generally connected on fiber due to the long distances involved. Like other networks, premises applications are usually multimode while OSP is singlemode to support longer links. For all except premises applications, fiber is the communications medium of choice, since its greater distance and bandwidth capabilities make it either the only choice or considerably less expensive than copper or wireless. Only inside buildings is there a choice to be made, and that choice is affected by economics, network architecture and the tradition of using copper inside buildings. Next, we’ll look at the fiber/copper/wireless choices in more detail. While discussions of which is better – copper, fiber or wireless – has enlivened cabling discussions for decades, it’s becoming moot. Communications technology and the end user market, it seems, have already made decisions that generally dictate the media and many networks combine all three. The designer of cabling networks, especially fiber optic networks, and their customers today generally have a pretty easy task deciding which media to use once the communications systems are chosen. Other than telco systems that still use copper for the final connection to the home, practically every cable in the telephone system is fiber optic. CATV companies use a high performance coax into the home, but it connects to a fiber optic backbone. The Internet backbone is all fiber. Most commercial buildings in populous areas have direct fiber connections from communications suppliers. Cities use SM fiber to connect municipal buildings, surveillance cameras, traffic signals and sometimes offer commercial and residential connections, all over singlemode fiber. Even cellular antenna towers along highways and on tall buildings usually have fiber connections. Remote areas such as central Africa depend on satellite communications since cables are too expensive to run long distances for the small amounts of traffic involved. Designing long distance or outside plant applications generally means choosing cabling containing singlemode (SM) fiber over all other media. Most of these systems are designed to be used over distances and speeds that preclude anything but SM fiber. Occasionally other options may be more cost effective, for example if a company has two buildings on opposite sides of a highway, a line-of-sight or radio optical wireless network may be easier to use since they have lower cost of installation and are easier to obtain relevant permits. The choice of the actual singlemode fiber, however, can depend on the application. Depending on the length of the link, the wavelength of the transmitters, data rate of the transmission and if CWDM or DWDM are planned, different types of fiber may be optimal. Refer to the section on on fiber for more details. Most building management systems use proprietary copper cabling, for example thermostat wiring and paging/audio speaker systems. Security monitoring and entry systems, certainly the lower cost ones, still depend on coax copper cable, although high security facilities like government and military installations often pay the additional cost for fiber’s more secure nature. When these premises communications systems connect to the outside world, it is generally to singlemode optical fiber. The entrance facility and equipment room must accommodate the equipment needed to make those connections. It is important to realize why and by whom these standards are written. These standards are written by manufacturers of products to ensure that various manufacturers’ products work together properly. Whenever users specify standards for any project, it is important that the contractor/installer understand what standards are being referenced and ensure that such standards are relevant to the job being done. To better understand installation and testing requirements, FOA recommends designers and installers refer to the NECA/FOA-301 standard on installing fiber optic networks and the FOA standards since they are written by contractors, designers, installers and users for their needs. Telecom has been standardized on fiber optics for 30 years now, so they have plenty of experience building and installing equipment. Since most telecom equipment uses industry conventions, you can usually find equipment for telecom transmission that will be available for short links (usually metropolitan networks, maybe up to 20-30 km), long distance and then really long distance like undersea runs. All run on singlemode fiber, but may specify different types of singlemode. Shorter telecom links will use 1310 nm lasers on regular singlemode fiber, often referred to as G.652 fiber, it’s international standard. Longer links will use a dispersion-shifted fiber optimized for operation with 1550 nm lasers (G.653 or G.655 fiber). For most applications, one of these will be used. Most telco equipment companies offer both options. Most CATV links are AM (analog) systems based on special highly linear lasers called distributed feedback (DFB) lasers using either 1310 nm or 1550 nm operating on regular singlemode fibers. As CATV moves to digital transmission, it will use technology more like telecom, which is already all digital. The choices become more complex when it comes to data and CCTV because the applications are so varied and standards may not exist. In addition, equipment may not be available with fiber optic transmission options, requiring conversion from copper ports to fiber using devices called media converters. In computer networks, the Ethernet standards, created by the IEEE 802.3 committee, are fully standardized. You can read the standards and see how far each equipment option can transmit over different types of fiber, choosing the one that meets your needs. Most network hardware like switches or routers are available with optional fiber optic interfaces, but PCs generally only come with UTP copper interfaces that require media converters. An Internet search for “fiber optic media converters” will provide you with dozens of sources of these inexpensive devices. Media converters will also allow the choice of media appropriate for the customer application, allowing use with multimode or singlemode fiber and may even offer transceiver options for the distance that must be covered by the link. CCTV is a similar application. More cameras now come with fiber interfaces since so many CCTV systems are in locations like big buildings, airports, or areas where the distances exceed the capability of coax transmission. If not, video media converters, usually available from the same vendors as the Ethernet media converters, are readily available and also inexpensive. Again, choose converters that meet the link requirements set by the customer application, which in the case of video, not only includes distance but also functions, as some video links carry control signals to the camera for camera pan, zoom and tilt in addition to video back to a central location. What about industrial data links? Many factories use fiber optics for its immunity to electromagnetic interference. But industrial links may use proprietary means to send data converted from old copper standards like RS-232, the ancient serial interface once available on every PC, SCADA popular in the utility industry, or even simple relay closures. Many companies that build these control links offer fiber optic interfaces themselves in response to customer requests. Some of these links have been available for decades, as industrial applications were some of the first premises uses of fiber optics, dating back to before 1980. Most operate over regular graded-index multimode fiber although some have been designed around large core PCS (plastic-clad silica) fibers. Whatever the application, it’s important for the end user and the cabling contractor to discuss the actual application with the manufacturer of the transmission hardware to ensure getting the proper equipment. While the telecom and CATV applications are cut and dried and the data (Ethernet) applications covered by standards, it is our experience that not all manufacturers specify their products in exactly the same way. One company in the industrial marketplace offered about fifteen different fiber optic products, mainly media converters for their control equipment. However, those fifteen products had been designed by at least a dozen different engineers, not all of whom were familiar with fiber optics and especially fiber jargon and specifications. As a result, one could not compare the products to make a choice or design them into a network based on specifications. Until their design, sales and applications engineers were trained in fiber optics and created guidelines for product applications, they suffered from continual problems in customer application. The only way to make sure you are choosing the proper transmission equipment is to make absolutely certain the customer and equipment vendor – and you – are communicating clearly what you are planning to do. Having decided to use fiber optics and chosen equipment appropriate for the application, it’s time to determine exactly where the cable plant and hardware will be located. One thing to remember – every installation will be unique. The actual placement of the cable plant will be determined by the physical locations along the route, local building codes or laws and other individuals involved in the designs. As usual, premises and outside plant installations are different so we will consider them separately. If the building is still in the design stage, you may have the opportunity to provide inputs on the needs of the cable plant. Ideally, that means you can influence the location of equipment rooms, routing of cable trays and conduits, availability of adequate conditioned power and separate data grounds, sufficient air-conditioning and other needs of the network. For pre-existing buildings, detailed architectural drawings will provide you with the ability to route cabling and network equipment around the obstacles invariably in your way. Outside plant (OSP) cabling installations have enormous variety depending on the route the cable must take. The route may cross long lengths of open fields, run along paved rural or urban roads, cross roads, ravines, rivers or lakes, or, more likely, some combination of all of these. It could require buried cables, aerial cables or underwater cables. Cable may be in conduit, innerduct or direct buried, aerial cables may be self-supporting or lashed to a messenger. Longer runs often include crossing water, so the cable may be underwater or be lashed across a bridge with other cables. Outside plant installations depend heavily on maps and data about the cable plant route. This can include basic data on the local geology, locations of road, buildings, underground and aerial utilities, and much more. GIS (Geographic Information Systems) are generally used to create very detailed maps of the routes of OSP cable plants during the design phase. It is beyond the scope of this book to examine GISs in detail but the designer should learn how to utilize a GIS to create the design to facilitate not only the design of the cable plant but also create documentation for the network. It is important to understand the limitation of GIS. For example the type of ground along the route can determine the methods of underground installation, with deep soil permitting direct burial, other soils requiring trenching and conduit and rocky areas precluding underground installation of any type. Aerial installations must be based on knowledge of the owners of the poles and the processes necessary to gain permission to use the poles and make ready for new cable installations. Do not use GIS alone. It is just one tool that can assist the designer but is not a replacement for traditional processes including site visits to evaluate the route. And as soon as possible, you must visit the site or route where the network will be installed. Outside plant routes need to be driven or walked every foot of the way to determine the best options for cable placement, obstacles to be avoided or overcome, and to determine what local entities may have input into the routing. Often cities or other governments will know of available conduits or rules on using utility poles that can save design time and effort. For installations inside current buildings, you should inspect every area to be absolutely certain you know what the building really looks like and then mark up drawings to reflect reality, especially all obstacles to running cabling and hardware and walls requiring firestopping that are not on the current drawings. Take pictures if you can. For buildings under construction, a site visit is still a good idea, just to get a feeling of what the final structure will be like and to get to know the construction managers you will be working with. They may be the best source of information on who the local authorities are who will be inspecting your work and what they expect. With all those options on OSP installations, where do you start? With a good map. Not just a road map or a topographical map, but satellite images overlaid on roads is much better, like “Google Maps” can provide. 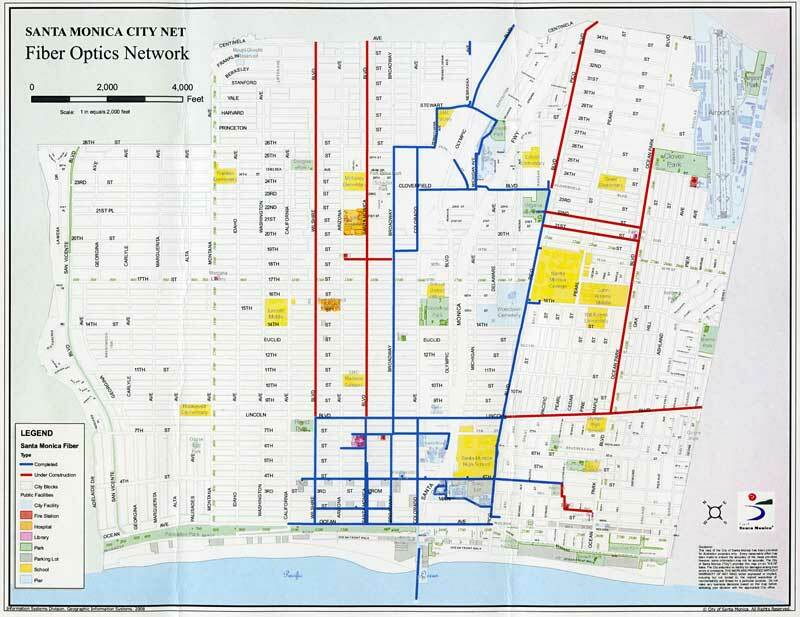 Creating a route map is the first step, noting other utilities along the route on that map, and checking with groups that document the current utilities to prevent contractors from damaging currently installed pipes and cables. Once you have marked up maps, the real “fun” begins: finding out whose permission you need to run your cabling. OSP installs are subject to approval by local, state and federal authorities who will influence heavily how your project is designed. Some cities, for example, ban aerial cables. Some have already buried conduit which you can use for specific routes. Since many municipalities have installed city-owned fiber networks, they may have fiber you can rent, rather than go through the hassle of installing your own. Unless you are doing work for a utility that has someone who already has the contacts and hopefully easements needed, you may get to know a whole new set of people who have control over your activities. And you have to plan for adequate time to get approval from everyone who is involved. 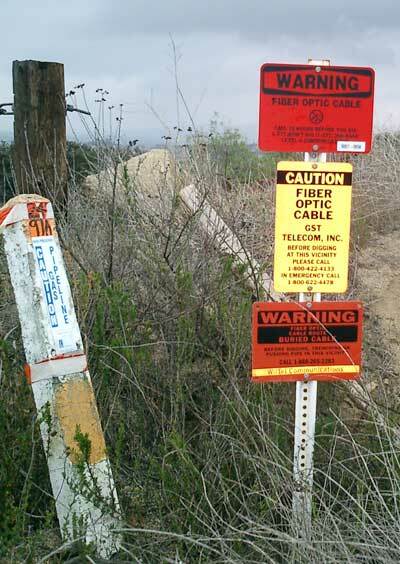 Governments and other organizations that control rights-of-way face a difficult problem in the Internet age - the continual digging up of their properties for cable plant installation. It's not uncommon for roads to be dug up multiple times for different cable plant owners and operators. This is expensive and disruptive. A simple solution is what is generally referred to as "Dig Once," a process where the cable plant installer who digs up rights-of-way installs excess conduits or ducts for future cable plant installation. When installing one cable with its associated ducts or conduits, the installer adds in several extra ducts for future use on the route. The number and type of ducts is based on projected future uses but is probably a minimum of 2 to 5. The requirement for additional ducts is specified in the contract with the cable plant owner and/or installer and the local authority generally owns the installed ducts. Future users lease duct space from the local authority and pull in their own cables. This "dig once" policy is especially useful in metropolitan areas where digging is most disruptive and cities looking at becoming "smart cities" find themselves in need of large fiber optic backbones to support desired services. Digging safely is vitally important. The risk is not just interrupting communications, but the life-threatening risk of digging up high voltage or gas lines. Some obstacles may be found during site visits, where signs like these are visible. There are several services that maintain databases of the location of underground services that must be contacted before any digging occurs, but mapping these should be done during the design phase and double-checked before digging to ensure having the latest data. If all this sounds vague, it is. Every project is different and requires some careful analysis of the conditions before even beginning to choose fiber optic components and plan the actual installation. Experience is the best teacher. When choosing components, most projects start with the choice of a cable. Cable designs are optimized for the application type. In OSP installations, cables may be underground, direct buried, aerial or submarine (or simply underwater.) More on OSP cable types. Underground cables are generally installed in conduit which is usually a 4 inch (10 cm) conduit with several innerducts for pulling cables. Here cables are designed for high pulling tension and lubricants are used to reduce friction on longer pulls. Automated pulling equipment that limits pulling tension protects the cables. Very long runs or those with more bends in the conduit may need intermediate pulls where cable is pulled, figure-8ed and then pulled to the next stage or intermediate pulling equipment is used. Splices on underground cables are generally stored above ground in a pedestal or in a vault underground. Sufficient excess cable is needed to allow splicing in a controlled environment, usually a splicing trailer, and the storage of excess cable must be considered in the planning stage. Microtrenching is another method used for underground installation, generally on roadways or in private yards for fiber to the home connections. Microtrenching involves digging a narrow and shallow trench about 25mm (1 inch) wide and 200-250mm (8-10 inches) deep using a special tool. Tools are available that can cut through asphalt or concrete roadways or sidewalks or for cutting in bare ground. After cutting the trench, one can install a special cable or microducts in which cables can be installed by blowing. A typical trench can accommodate a microduct with up to six ducts providing for future expansion. Aerial installations go from pole to pole, but the method of securing cables can vary depending on the situation. Some cables are lashed to messengers or other cables, such as CATV where light fiber cables are often lashed to the heavy coax already in place. Cables are available in a “8” configuration with an attached steel messenger that provides the strength to withstand tension on the cable. Some cables are made to directly be supported without a messenger, called all-dielectric sefl-supporting cables that use special hardware on poles to hold the cables. Optical ground wire is used by utilities for high voltage distribution lines. This cable is an electrical cable with fibers in the middle in a hermetically-sealed metal tube. It is installed just like standard electrical conductors. Splices on aerial cables can be supported on the cables or placed on poles or towers, Most splices are done on the ground, although it is sometimes done in a bucket or even on a tent supported on the pole or tower. Hardware is available for coiling and storing excess cable. Sometime OSP installations involve running cables across rivers or lakes where other routes are not possible. Special cables are available for this that are more rugged and sealed. Even underwater splice hardware is available. Landings on the shore need to be planned to prevent damage, generally by burying the cable close to shore and marking the landing. Transoceanic links are similar but much more complex, requiring special ships designed for cable laying. Since OSP applications often use significant lengths of cables, the cables can be made to order, allowing optimization for that particular installation. This usually allows saving costs but requires more knowledge on the part of the user and more time to negotiate with several cable manufacturers. To begin specifying the cable, one must know how many fibers of what type will be included in each cable. It’s important to realize that fiber, especially singlemode fiber used in virtually all OSP installations, is cheap and installation is expensive. Installation of an OSP cable may cost a hundred times the cost of the cable itself. Choosing a singlemode fiber is easy, with basic 1300 nm singlemode (called G.652 fiber) adequate for all but the longest links or those using wavelength-division multiplexing. Those may need special fiber optimized at 1500-1600 nm (G.653 or G.654). For premises and campus cable plants, OM3 type laser-optimized 50/125 multimode fiber is probably the best choice for any multimode OSP runs, as its lower attenuation and higher bandwidth will make most networks work better. Including more fibers in a cable will not increase the cable cost proportionally; the basic cost of making a cable is fixed but adding fibers will not increase the cost much at all. Choosing a standard design will help reduce costs too, as manufacturers may have the cable in stock or be able to make your cable at the same time as others of similar design. The only real cost for adding more fibers is additional splicing and termination costs, still small with respect to total installed cost. And remember that having additional fibers for future expansion, backup systems or in case of breaks involving individual fibers can save many future headaches. Common traits of all outside plant cables include strength and water or moisture protection. The necessary strength of the cable will depend on the installation method (see below.) All cables installed outdoors must be rated for moisture and water resistance. Until recently, most people chose a gel-filled cable, but now dry-water blocked cables are widely available and preferred by many users. These cables use water-absorbing tape and power that expands and seals the cable if any water enters the cable. Installers especially prefer the dry cables as it does not require the messy, tedious removal of the gel used in many cables, greatly reducing cable preparation for splicing or termination. OSP cable construction types are specifically designed for strength depending on where they are to be direct buried, buried in conduit, placed underwater or run aerially on poles. The proper type must be chosen for the cable runs. Some applications may even use several types of cable. Having good construction plans will help in working with cable manufacturers to find the appropriate cable types and ordering sufficient quantities. One must always order more cable than route lengths, to allow for service loops, preparation for termination and excess to save for possible restoration needs in the future. Like cable types, cable plant hardware types are quite diverse and should be chosen to match the application type and cable types being used. With so many choices in hardware, working with cable manufacturers is the most expeditious way to chose hardware and ensure compatibility. Besides cable compatibility, the hardware must be appropriate for the location, which can be outdoors, hung on poles, buried, underwater, inside pedestals, vaults or buildings, etc. Sometimes the hardware will need to be compatible with local zoning, for example in subdivisions or business parks. The time consumed in choosing this hardware can be lengthy, but is very important for the long term reliability of the cable plant. Splicing and termination are the final category of components to be chosen. Most OSP singlemode fiber is fusion spliced for low loss, low reflectance and reliability. Multimode fiber, especially OM2, 3 and 4, is also easily fusion spliced, but if only a few splices are necessary, mechanical splicing may provide adequate performance and reliability. Finished splices are placed in a splice tray and placed in a splice closure outdoors or optionally in trays on patch panels indoors. They are sealed to prevent moisture reaching the splices and are designed to be re-entered for repair or re-routing fibers. Splice closures are available in hundreds of designs, depending on the placement of the closure, for example underground in a manhole or vault, above ground in a pedestal, buried underground or mounted on a pole. Closures must also be chosen by the number and types of cables being spliced and whether they enter at both ends or only one. The numbers of cables and splices that a closure can accommodate will determine the size of the closure, and those for high fiber count cables can get quite large. Splice trays generally hold twelve single fiber fusion splices but may hold fewer ribbon or mechanical splices. Each splice tray should securely hold the splice and have a cover to protect the fibers when stacked in the closure. Singlemode fibers are best terminated by fusion spicing factory-made pigtails onto fibers in the cable and protecting the splices in a closure or patch panel tray. If termination is done directly on multimode OSP cables, breakout kits will be necessary to sleeve fibers for reliability when connectors are directly attached. This takes more installation time than splicing pre-terminated pigtails on the cables, as is common with singlemode fiber cables, and may not save any costs. Even complete preterminated outside cable plant systems are becoming available, reducing the time necessary for termination and splicing. Talk to the cable manufacturers to determine feasibility of this option. Outdoor terminations are sometimes housed in pedestals or equipment housings such as those used for local phone switches or traffic control systems. Some of these closures may not be fully sealed from dust and moisture, in which case it is recommended that the fiber connections be inside a more protective housing to prevent future unreliability. Choosing the proper components for OSP installations can take time, but is important for system operation. Once components are chosen, the materials lists are added to the documentation for purchase, installation and future reference. Premises cabling and outside plant cabling will coexist in the entrance facility or the equipment room where the two are connected. The choice of premises fiber optic components are affected by several factors, including the choice of communications equipment, physical routing of the cable plant and building codes and regulations. If the design is a corporate network (LAN), the design will probably include a fiber optic backbone connecting computer rooms to wiring closets. The wiring closets house switches that convert the fiber backbone to UTP copper for cable connected desktops and either copper or fiber to wireless access points. Some desktops, especially in engineering or design departments, may require fiber to the desktop for it’s greater bandwidth. Extra cables or fibers may be needed for security systems (alarms, access systems or CCTV cameras) and building management systems also. Design of the fiber optic cable plant requires coordinating with everyone who is involved in the network in any way, including IT personnel, company management, architects and engineers, etc. to ensure all cabling requirements are considered at one time, to allow sharing resources. As in OSP design, consider the fiber choice first. Most premises networks use multimode fiber, but many users now install hybrid cables with singlemode fibers for future expansion. The 62.5/125 micron fiber (OM1 fiber) that has been used for almost two decades has mostly been superceded by the new 50/125 laser-optimized fiber (OM3 or OM4), as it offers substantial bandwidth/distance advantages. Virtually all equipment will operate over 50/125 OM3 or OM4 fiber just as well as it did on 62.5/125 OM1 fiber, but it’s always a good idea to check with the equipment manufacturers to be sure. Remember in the design documentation to include directions to mark all cables and patchpanels with aqua-colored tags, indicative of OM3 or OM4 fiber. Cable in premises applications is generally either distribution or breakout cable. Distribution cables have more fibers in a smaller diameter cable, but require termination inside patch panels or wall mounted boxes. Breakout cables are bulky, but they allow direct connection without hardware, making them convenient for industrial use. Fiber count can be an issue, as backbone cables now have many fibers for current use, future expansion and spares, making distribution cables the more popular choice. On all indoor cables, the cable must be rated as fire-retardant per the NEC, CEC or other building codes. In the NEC terminology, indoor cables are generally OFNR-rated (Riser) unless the cable in air-handling areas above ceilings, where OFNP (plenum) is needed. Cable jacket color for OM3 cables can be ordered in aqua for identification as both fiber optics and OM3 or OM4 50/125 fibers. If the cable is going to be run between buildings, indoor/outdoor designs are now available that have dry water-blocking and a double jacket. The outer jacket is moisture-resistant for outdoor use but can be easily stripped, leaving the fire-rated inner jacket for indoor runs. Fiber optic connector choices are also changing. STs and even SCs are succumbing to the success of the smaller LC connector. Since most fast (gigabit and above) equipment uses LC connectors, using them in the cable plant means only one connector needs to be supported. The LC offers another big advantage for those users who are upgrading to OM3 fiber. The LC connector is incompatible with SC and ST connectors, so using it on 50/125 fiber cable plants prevents mixing 50 and 62.5 fibers with high fiber mismatch losses. Premises fiber optic cables need to be run separately from copper cables to prevent crushing. Sometimes they are hung carefully below copper cable trays or pulled in innerduct. Using innerduct can save installation time, since the duct (which can be purchased with pull tapes already inside) can be installed quickly without fear of damage and then the fiber optic cable pulled quickly and easily. Some applications may require installing fiber optic cables inside conduit, which requires care to minimize bends, provide intermediate pulls to limit pulling force or use fiber optic cable lubricants. The hardware necessary for the installation will need to be chosen based on where the cables are terminated. Premises runs are generally point-to-point and are not spliced. Wherever possible, allow room for large radii in the patch panels or wall-mounted boxes to minimize stress on the fibers. Choose hardware that is easy to enter for moves, adds and changes but lockable to prevent intrusion. In premises applications, it’s worth considering a preterminated system. These use backbone cables terminated in multifiber connectors and preterminated patch panel modules. If the facility layout is properly designed, the cable manufacturer can work with you to create a “plug and play” system that needs no on-site termination and the cost may be very competitive to a field-terminated system. For every installation, a complete materials list must be created listing each component needed and quantities required. This list will be used by the installation crew, but first it will be used to estimate the cost of the project. It is very important to list every component. Some components can be estimated based on other quantities. Ducts for example will be ordered in lengths similar to the cable pulled into them. Each fiber needs termination on both ends of the cable plant. Splice trays and closures must be ordered according to the numbers of fibers in the cables. You should include extra quantities for installation. Every splice point, for example, needs 10-20 meters extra cable for splicing in a splice trailer, stripping for the splice and service loops. Extra cable should also be ordered to be kept for possible future restoration. Extra connectors or pigtails are needed to replace those improperly installed during installation. Some contractors routinely order 2-5% more than they estimate is necessary for the job. While ordering more components than necessary can be costly, it’s less expensive than being short during the actual installation, especially for special order items like cables or patchcords. Excess components should be packed and stored as part of a restoration kit. More on estimating fiber optic projects. Loss budget analysis is the calculation and verification of a fiber optic system's operating characteristics. It is used to estimate the loss of a cable plant being installed, determine if the cable plant will work with any given transmission system and provide an estimate for comparison to actual test results. A link loss budget encompasses items such as the length of the link, fiber type, wavelengths, connectors and splices, and any other sources of loss in the link. Attenuation and bandwidth are the key parameters for budget loss analysis, but since we cannot test attenuation, we generally use limits for loss set by the standards for the systems or networks we are going to use on the link. (Here is a table of link losses from industry standards for many links.) The designer should analyze link loss early in the design stage prior to installing a fiber optic system to make certain the system will work over the proposed cable plant. From the system standpoint, we have a limit to the loss it can tolerate on the cable plant, called a power budget, determined from the output of the transmitter and the required input of the receiver. We define these errors for the system as "bit-error rate" and they may be caused by too little power or too much power at the receiver. It is important to note that most calculations focus on the cable plant loss being low enough for the system power budget. However, on some systems, especially laser-based singlemode systems, the receiver may not tolerate too low a loss which causes high power at the receiver and may overload it, causing transmission errors. Under such conditions, an attenuator is added at the receiver end of the link to lower the power to an acceptable level. Both the passive and active components of the circuit can be included in the budget loss calculation. Passive loss is made up of fiber loss, connector loss, and splice loss. Don't forget any couplers or splitters in the link. If the specifications for a type of system or network are not known, industry generic or standard loss values for the fiber optic components can be used for calculating the loss budget for the cable plant. Prior to system turn up, test the insertion loss of the cable plant with a source and power meter to ensure that it is within the loss budget. The idea of a loss budget is to ensure the network equipment will work over the installed fiber optic link. One issue is what values should one should use for component losses when making the calculations. One can use the values in some industry standards like TIA-568 which are considered very high, one can use typical values, one can use values from component manufacturers which may be nearer typical or the user may have values that they require, not unusual for sophisticated users like telcos. It is normal to be conservative over the specifications. Don't use the best possible specs for fiber attenuation or connector loss to allow some margin for installation and component degradation over time. The best way to illustrate calculating a loss budget is to show how it's done for a typical cable plant, here a 2 km hybrid multimode/singlemode link with 5 connections (2 connectors at each end and 3 connections at patch panels in the link) and one splice in the middle. See the drawings below of the link layout and the instantaneous power in the link at any point along it's length, scaled exactly to the link drawing above it. Multimode connectors will have losses of 0.2-0.5 dB typically. Singlemode connectors, which are factory made and fusion spliced on will have losses of 0.1-0.2 dB. Field terminated singlemode connectors may have losses as high as 0.5-1.0 dB. Let's calculate it at both typical and worst case values. Many designers and technicians forget when doing a loss budget that the connectors on the end of the cable plant must be included in the loss budget. When the cable plant is tested, the reference cables will mate with those connectors and their loss will be included in the measurements. Add together the fiber, connector and splice losses to get the total link loss of the cable plant. Link loss budget for network hardware depends on the dynamic range, the difference between the sensitivity of the receiver and the output of the source into the fiber. You need some margin for system degradation over time or environment, so subtract that margin (as much as 3dB) to get the loss budget for the link. In the past, as a general rule, the Link Loss Margin was expected be greater than approximately 3 dB to allow for link degradation over time or splicing for restoration. LEDs or lasers in the transmitter may age and lose power, connectors or splices may degrade or connectors may get dirty if opened for rerouting or testing. If cables are accidentally cut, excess margin will be needed to accommodate splices for restoration. Today some systems, particularly high bit rate multimode LANs, have little margin due to the high bandwidth required. Some of these links require assuming fiber and connector loss to be extremely low to even accommodate the small power budget available. Under such conditions, one has to assume lower values, especially for connector loss, and, of course, require installers to be extremely careful in installation to meet these needs. More on link loss budgets. FOA offers a free App for smartphones and tablets to calculate loss budgets. Check the App Store for "FOA LossCalc." Documentation of the cable plant is a necessary part of the design and installation process for a fiber optic network that is often overlooked. Documenting the installation properly during the planning process will save time and material in the installation. It will speed the cable installation and testing since the routing and terminations are already known. After component installation, the documentation should be completed with loss test data for acceptance by the end user. During troubleshooting, documentation eases tracing links and finding faults. Proper documentation is usually required for customer acceptance of the installation. All this documentation gets included in the project paperwork that includes a Scope of Work (SOW), Request For Proposal or Quotation (RFP or RFQ) and the project Contract between the contractor and the customer. More on the project paperwork is here. The documentation process begins at the initiation of the project and continues through to the finish. It must begin with the actual cable plant path or location. 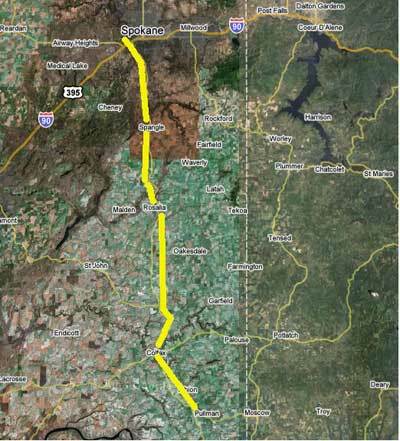 OSP cables require documentation as to the overall route, but also details on exact locations, e.g. on which side of streets, which cable on poles, where and how deep buried cables and splice closures lay and if markers or tracing tape is buried with the cable. Premises cables require similar details inside a building in order for the cable to be located anywhere in the path. Most of this data can be kept in CAD drawings and a database or commercial software that stores component, connection and test data. Long outside plant links that include splices may also have OTDR traces which should be stored as printouts and possibly in computer files archived on disks for later viewing in case of problems. A computer with proper software for viewing traces must be available, so a copy of the viewing program should be on the disks with the files. If the OTDR data is stored digitally, a listing of data files should be kept with the documentation to allow finding specific OTDR traces more easily. Documentation begins with a basic layout for the network. A sketch on building blueprints may work for a small building but a large campus, metropolitan or long distance network will probably need a complete CAD layout. 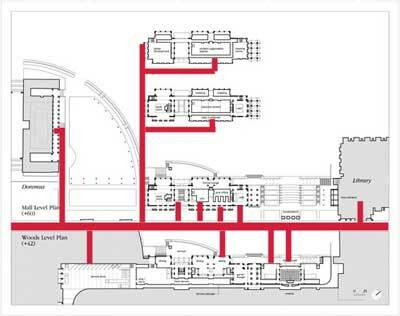 The best way to set up the data is to use a facility drawing and add the locations of all cables and connection points. 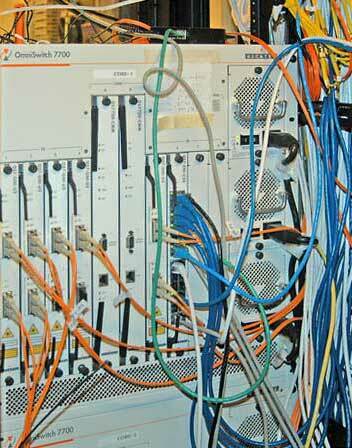 Identify all the cables and racks or panels in closets and then you are ready to transfer this data to a database. It will help to know what types of panels and hardware are being used, and what end equipment is to be connected. If you are installing a big cable plant with many dark (unused) fibers, some will probably be left open or unterminated at the panels, and that must be documented also. Whenever designing a network, it's a very good idea to have spare fibers and interconnection points in panels for future expansion, rerouting for repair or moving network equipment. Documentation is more than records. All components should be labeled with color-coded permanent labels in accessible locations. Once a scheme of labeling fibers has been determined, each cable, accessible fiber and termination point requires some labeling for identification. A simple scheme is preferred and if possible, explanations provided on patch panels or inside the cover of termination boxes. Cable plant documentation records are very important documents. Keep several backup copies of each document, whether it is stored in a computer or on paper, in different locations for safekeeping. If a copy is presented to the customer, the installer should maintain their own records for future work on the project. One complete set on paper should be kept with a “restoration kit” of appropriate components, tools directions in case of outages or cable damage. Documentation should be kept up to date to be useful so that task should be assigned to one on-site person with instructions to inform all parties keeping copies of the records of updates needed. Access to modify records should be restricted to stop unauthorized changes to the documentation. Once the design of a fiber optic project is complete and documented, one might think the bulk of the design work is done. But in fact, it’s just beginning. The next step is to plan for the actual installation. Planning for the installation is a critical phase of any project as it involves coordinating activities of many people and companies. The best way to keep everything straight is probably to develop a checklist based on the design during the early stages of the project. Perhaps the most important issue is to have a person who is the main point of contact for the project. The project manager needs to be involved from the beginning, understands the aims of the project, the technical aspects, the physical layout, and is familiar with all the personnel and companies who will be involved. Likewise all the parties need to know this person, how to contact them (even 24/7 during the actual install) and who is the backup if one is needed. The backup person should also be involved to such a degree that they can answer most questions, may even be more technically savvy on the project, but may not have full decision-making authority. The backup on big jobs may well be the person maintaining the documentation and schedules, keeping track of purchases and deliveries, permits, subcontractors, etc. while the project manager is more of a hands-on manager. Planning for a project is critical to the success of the project. The best way is to develop a checklist before beginning the design process. The checklist below is comprehensive but each project will have some of its own unique requirements that need to be added. Not all steps need be done serially, as some can be done in parallel to reduce time required for designing the project. The designer must interface with many other people and organizations in designing a project so contacts for outside sources should be maintained with the design documentation. The final project checklist will have many items, all of great importance. Each item needs a full description, where and when it will be needed and who is responsible for it. See Chapter 10 for a recommended project installation checklist. Components like cables and cable plant hardware should indicate vendors, delivery times and where, when and sometimes how it needs to be delivered. Special installation equipment needs to be scheduled also, with notes of what is needed to be purchased and what will be rented. If the jobsite is not secure and the install will take more than a day, security guards at the jobsite(s) may need to be arranged. A work plan should be developed that indicates what specialties are going to be needed, where and when. Outside plant installations (OSP) often have one crew pulling cable, especially specialty installs like direct burial, aerial or underwater, another crew splicing and perhaps even another testing. OSP installers often do just part of the job since they need skills and training on specialized equipment like fusion splicers or OTDRs and installation practices like climbing poles or plowing-in cables. Inputs from the installation crews can help determine the approximate time needed for each stage of the installation and what might go wrong that can affect the schedule. And things will go wrong. All personnel working on the project should be briefed on the safety rules and preferably be given a written copy. Supervisors and workers should have contact numbers for the project manager, backup and all other personnel they may need to contact. Since some projects require working outside normal work hours, for example airports or busy government buildings where cabling is often done overnight, having a project manager available – preferably onsite – while the work is being done is very important. During the installation itself, a knowledgeable person should be onsite to monitor the progress of installation, inspect workmanship, review test data, create daily progress reports and immediately notify the proper management if something looks awry. If the project manager is not technically qualified, having someone available who is technical is important. That person should have the authority to stop work or require fixes if major problems are found. This chapter primarily focuses on the unique aspects of fiber optic cable plant design and installation, but this process cannot be done in a vacuum. Projects may require the sign-offs of architects or PEs (Professional Engineers) who are licensed in the area and involved in the project. Cable plants may require working with cities or counties for permits or easements, cooperation from other organizations to allow access through their property and construction disruptions. Any communications system requires not only the cable plant but facilities for termination at each end, placing communications equipment, providing power (usually uninterruptible data quality power) and a separate data ground which may require the services of an electrical contractor. Inside the facility, connections must be made to the end users of the link. The installation may require inspections by building and/or electrical inspectors and contractors may require electrical and/or low voltage or fiber optic licenses from local authorities. Customers often require certifications such as the FOA CFOT for contractors and installers to work on a project. The large number of options involved in almost every project make it impossible to summarize the issues in a few sentences, so let’s just say you must consider the final, complete design to gain cooperation and coordinate the final installation. One of the most valuable assets you can have when designing and installing a fiber optic project is an experienced contractor. Every installation requires confirmation that components are installed properly. The installer or contractor wants to ensure the work is done properly so the customer is satisfied and callbacks for repair will not be necessary. Customers generally require test results as well as a final visual inspection as part of the documentation of a proper installation before approving payment. In our experience, however, there is often confusion about exactly what should be tested and how documentation of test results is to be done on fiber optic projects. These issues should be agreed upon during the design phase of the project. Project paperwork should include specifications for testing, references to industry standards and acceptable test results based on a loss budget analysis done during the design phase of the project. FOA standards are an easy way to have test methods agreed among all parties. The process of testing any fiber optic cable plant may require testing three times, testing cable on the reel before installation, testing the insertion loss of each segment as it is installed with an optical loss test set (OLTS, another name for a light source and power meter), perhaps verifying every splice as it is made using an OTDR and finally testing complete end to end loss of every fiber in the cable plant. Practical testing usually means testing only a few fibers on each cable reel for continuity before installation to ensure there has been no damage to the cable during shipment. Then each segment is tested as it is spliced and/or terminated by the installers. Finally the entire cable run is plugged together and tested for end-to-end loss for final documentation. After cable installation, splicing and termination, each segment of the cable plant should be tested individually as it is installed, to ensure each splice, connector and cable is good. One should never complete splicing cables without verifying the splices are properly done with an OTDR before sealing the splice closure. Finally each end to end run (from equipment to equipment connected on the cable plant) should be tested for loss as required by all standards. Remember that each fiber in each cable will need to be tested, so the total number of tests to be performed is calculated from the number of cable segments times the number of fibers in each cable. This can be a time-consuming process. Before finishing, it is important to ensure the fibers are documented and arranged properly. When equipment is installed, another parameter becomes important, polarity. Most fiber links use two fibers transmitting in opposite directions, so it's important to check that the transmitters are connected to the receivers which often requires a crossover somewhere in the cable plant. Documentation should show how the fibers are to be connected to equipment. If the contractor installs the communications equipment, it may be necessary to test each data link also. Testing the complete cable plant requires insertion loss testing with a source and power meter or optical loss test set (OLTS) per standard test procedure. The test plan should specify the “0 dB” reference method option (one, two or three reference cables) as this will affect the value of the loss. Some standards call for a one cable reference, but this may not be possible with all combinations of test sets and cable plant connectors. The required test methods need to be agreed upon by the contractor and user beforehand. FOA standards provide a simple solution to this problem. OTDR testing is generally done on outside plant cables, but OTDR testing alone is often not acceptable for cable plant certification. Long lengths of outside plant cabling which include splices should be tested with an OTDR to verify splice performance and look for problems caused by stress on the cable during installation. While there are advocates of using OTDRs to test any cable plant installation, including short premises cables, it is generally not required by industry standards nor is it appropriate for short links common to premises cabling. The shorter lengths of premises cabling runs and frequent connections with high reflectance often create confusing OTDR traces that cause problems for the OTDR autotest function and are sometimes difficult for even experienced OTDR users to interpret properly. Long OSP cables may require special testing for spectral attenuation (S), chromatic dispersion (CD) and polarization mode dispersion (PMD). These are specialized tests required to ensure DWDM and high bit rate systems operate properly. The Test Plan should be coordinated with the cable plant documentation. The documentation must show what links need testing and what test results are expected based on loss budget calculations. The Test Plan should also specify how the test data are incorporated into the documentation for acceptance of the installation and for reference in case of future cabling problems that require emergency restoration. About once a day in the USA, a fiber optic cable is broken by a contractor digging around the cable, as this photo shows. Premises cables are not as vulnerable, except for damage caused by clumsy personnel or during the removal of abandoned cables. Any network is susceptible to damage so every installation needs a restoration plan. Efficient fiber optic restoration depends on rapidly finding the problem, knowing how to fix it, having the right parts and getting the job done quickly and efficiently. Like any type of emergency, planning ahead will minimize the problems encountered. Documentation is the most helpful thing you can have when trying to troubleshoot a fiber network, especially during restoration. Start with the manufacturer’s datasheets on every component you use: electronics, cables, connectors, hardware like patch panels, splice closures and even mounting hardware. Along with the data, one should have manufacturer’s “help line” contact information, which will be of immense value during restoration. During installation, mark every fiber in every cable at every connection and keep records using cable plant documentation software or a simple spreadsheet of where every fiber goes. When tested, add loss data taken with an optical loss test set (OLTS) and optical time domain reflectometer (OTDR) data when available. Someone must be in charge of this data, including keeping it up to date if anything changes. You must have available proper test equipment to troubleshoot and restore a cable plant. An OLTS should also have a power meter to test the power of the signals to determine if the problem is in the electronics or cable plant. Total failure of all fibers in the cable plant means a break or cut in the cable. For premises cables, finding the location is often simple if you have a visual fault locator or VFL, which is a bright red laser coupled into the optical fiber that allows testing continuity, tracing fibers or finding bad connectors at patch panels. For longer cables, an OTDR will be useful. Outside plant networks should use the OTDR to document the cable plant during installation, so during restoration a simple comparison of installation data with current traces will usually find problems. OTDRs can also find non-catastrophic problems, for example when a cable is kinked or stressed, so it only has higher loss, which can also cause network problems. Once you find the problem, you have to repair it. Repair requires having the right tools, supplies and trained personnel available. Besides the test equipment needed for troubleshooting, you need tools for splicing and termination, which may include a fusion splicer for outside plant cables. You also need components necessary for restoring the cable plant. For every installation, a reasonable amount of excess cable and installation hardware should be set aside in storage for restoration. Some users store the restoration supplies along with documentation in a sealed container ready for use. Remember that the fiber optic patchcords that connect the electronics to the cable plant can be damaged also, but are not considered repairable. Just keep replacements available. One big problem in restoring damaged cables is pulling the two cable ends close enough to allow splicing them together. You need several meters of cable on each end to strip the cable, splice the fibers and place them in a splice closure. Designing the cable plant with local service loops is recommended. If the cable ends are too short , or the damaged cable is underground or buried, you will have to splice in a new section of cable. Since the restoration cable must match the damaged cable or at least have a greater nuber of fibers, the best source of cable for restoration is cable leftover from the original installation. Manufacturers also can supply cable restoration kits that include cable and splice closures. What else besides cables and cable plant hardware should be in a restoration kit? You should have a termination or mechanical splice kit and proper supplies. For splices, you need splice closures with adequate space for a number of splices equal to the fiber count in the cable. All these should be placed in a clearly marked box with a copy of the cable plant documentation and stored in a safe place where those who will eventually need it can find it fast. Personnel must be properly trained to use this equipment and do the troubleshooting and restoration. And, of course, they must be available on a moments notice. The biggest delay in restoring a fiber optic communications link is often the chaos that ensues while personnel figure out what to do. Having a plan that is known to the responsible personnel is the most important issue. Major users of fiber optics have restoration plans in place, personnel trained and kits of supplies ready for use. It’s doubtful that most premises users are ready for such contingencies. Users may find that the cost of owning all this expensive equipment is not economic. It may be preferable to keep an inexpensive test set consisting of a VFL and OLTS at each end of the link and having an experienced contractor on call for restoration. First, someone has to be in charge, and everyone involved must know they are the boss, including them. During the project, they must be readily available for consultation and updates. While this may sound obvious, sometimes the network user’s representative has other responsibilities (like managing an IT department) and may not be able or willing to direct full attention to the project. Whoever is assigned the task of managing the project must be involved and available, preferably on the job site, full time. If necessary, delegate responsibility to the contracting construction supervisor with requirements for daily reports and personal updates. Make certain that everyone responsible for parts of the project have appropriate documentation and have reviewed the installation plan. Everyone should have toured the relevant job sites and be familiar with locations. They must also know who to contact about questions on the sites, within the network user, the contractor and any outside organizations such as local governments or utilities. Everyone needs to have contact information for each other (cell phones usually, since email may be too slow and instant messaging will probably not be available to field workers.) The onsite supervisor should have a digital camera and take plenty of photos of the installation to be filed with the documentation for future reference and restoration. Locations of components, tools and supplies should be known to all personnel. On larger jobs, managing equipment and materials may be a full time job. Special equipment, like splicing trailers or bucket trucks, should be scheduled as needed. Rental equipment should be double checked with the suppliers to ensure delivery to the job site on time. Contacts for vendor technical support should be noted on documentation for the inevitable questions arising during installation. Outside plant installs may require local authorities to provide personnel for supervision or police for protection or traffic management on public job sites, so they must also become involved in the scheduling. If job inspections are required, arrangements should be made so that the job interruptions for inspections are minimized. Supervisory personnel must be responsible for job site safety and have appropriate contact information, including for public services like police, fire and ambulance. If the project is large enough to last several days or more, daily meetings to review the day’s progress are advisable. At a minimum, it should involve the onsite construction supervisor and the network user’s person in charge of the project. As long as things are going well, such a meeting should be short. On longer projects, overnight security personnel at job sites should have contact information for the job manager who must be available 24/7 as well as public service contacts. Inspection and testing of the installed cable plant should not be left until after the job is completed. Testing continually during installation can find and fix problems such as cable stresses or high termination losses before those problems become widespread. Each installer doing testing should have documentation with loss budget calculations and acceptable losses to use for evaluating the test results. Installers should be double-checking each other’s work to ensure quality. What do you do when (not if) things go wrong? Here judgment calls are important. When something happens, obviously it is the responsibility of the onsite supervisor to decide quickly if they can take care of it. If not, they must know who needs to be brought in and who needs to be notified. By reviewing progress regularly, disruptions can be minimized. Equipment failures, e.g. a fusion splicer, can slow progress, but other parts of the project like cable laying can continue, with splicing resumed as soon as replacement equipment is available. Problems with termination should be reviewed by an installer with lots of experience and the cure may require new supplies or turning termination over to more experienced personnel. Never hesitate to call vendor support when these kinds of questions or problems arise. Following the completion of the install, all relevant personnel should meet, review the project results, update the documentation and decide if anything else needs to be done before closing the project. Safety is an important part of the planning process for any fiber optic installation. Later in this chapter, we have a section called " Safety In Working With Optical Fiber" that covers the issues specific to dealing with optical fiber when preparing cables and splicing, terminating and testing them. But with any installation there are many other aspects of safety that the installer must consider. Work areas for OSP installation are often near roads, railways, utilities or other areas with potential hazards. Digging trenches or directional boring requires knowing where underground utilities are located and confirming their locations before final digging. Premises installations often require working near power cables and other indoor utilities, as well as workers who may be in a building during the installation. The installer is expected to know and follow all laws, codes and local requirements for safe installations such as those by agencies like OSHA in the USA. Workers should be trained in these practices also. Work sites should have safety regulations posted including required safety gear to be worn by workers and supervisors should monitor the site to ensure these rules are followed. References for the fiber optic designer’s bookshelf include the FOA texts,The FOA Online Reference Guide to Fiber Optics , printed textbooks or eBooks The FOA Reference Guide to Outside Plant Fiber Optics, The FOA Reference Guide to Fiber Optics, and The FOA Reference Guide to Premises Cabling. Reference standards include the FOA Standards and NECA/FOA-301 installation standard which are available free. When it comes to the NEC, Limited Energy Systems, a textbook published by the NFPA, is very useful. There are dozens of books on communications system design, but unfortunately, the fast pace of development in communications technologies means that many textbooks are hopelessly out of date unless it’s updated frequently. Better to rely on the web, especially the FOA Reference Guide site and websites of well-established manufacturers. More on fiber optic network design. (C)2010-18, The Fiber Optic Association, Inc.